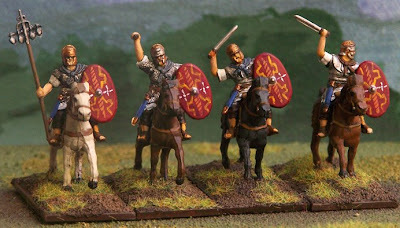 For a couple years now I have had a box of Hat Industrie's #8066 Imperial Roman Auxiliary Cavalry. I finally painted them in preparation for my Song of Blades and Heroes scenario. The photo above includes one of each pose. This is a great little set. The detail is quite high, especially in the helmets. The shields fit so snugly on their hands' that you don't need to use glue! The standard can be trimmed down to be a spear, but everyone else carries a sword. While painting the horseman in scale armor (to the right of the standard bearer) I noticed that he had a sword in his sheath. Obviously, this model was meant to carry a spear. The sprue does not come with any spears, but one could easily use wire or a trimmed piece of paperclip. I ended up keeping a sword in hand, while trimming the hilt away from the 2nd sword on his belt. My only criticism of this set is the saddle. The back is one solid piece, rather than the individual horns typical of Celtic and Roman saddles. Their saddles had four projections, which cradled the thighs of the rider. I was annoyed at the models' inaccuracy, but after reading the review on PSR I learned this was probably due to limitations of the mold. In any case, the problem is easy to fix. I just carved out a piece to form individual horns. The tear-drop standard featured in this set is from the funerary monument of Quintus Carminius Ingenuus, 1st century AD. The Cavalryman, by Peter Connolly. 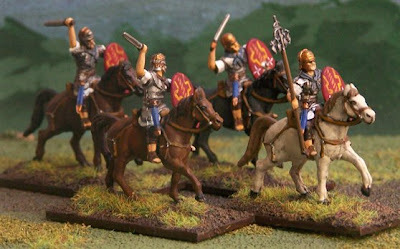 The Roman Cavalry, by Karen Dixon. I do like what you have done with these figures. They paint up really well. Thanks! I have a whole mess of these 1/72 models. It's about time I started painting them. Like you said on your blog, it's nice to go back and paint stuff you've been holding on to for years.